LPRS' easyRadio Advanced (eRA) incorporates the latest version of LPRS’s easyRadio software protocol. This removes the complexities of developing a software interface to the wireless modules, significantly reducing end product development times. The many existing users of easyRadio version 02 will find eRA pin-compatible and can easily upgrade their products to the new 'advanced' versions as required. Free flash firmware upgrade tools are available to allow customers to quickly install any required updates making easyRadio a truly future-proof wireless solution. The latest eRA software allows developers to change many of the parameters of the radio to suit the individual application. The bandwidth of the module may be adjusted between 100KHz and 12.5KHz giving narrow-band performance on a wide-band budget and a user configurable self-coding system enables interfacing to other raw data modules in both FSK (FM) and ASK (AM) modulation modes. Other new features include a new digital received signal strength indication (RSSI), reducing the requirement of the host system to handle A-D measurements. The RSSI signal may be delivered as a simple command for either the current RSSI level or the signal strength of the last received packet. eRA also allows a temporary channel selection allowing the host to scan other channels in real time without storing settings on the internal EEPROM thereby maximising the life of the EEPROM. Users may programme transmission frequency (up to 132 channels), output power (up to 10mW), serial data rate (up to 115.20Kbps maximum), digital RSSI, carrier detect, FSK and ASK modulation and bandwidths (12.5KHz, 25KHz, 50KHz, 100KHz). To maintain frequency accuracy within +/- 1KHz over the module’s full operating temperature range of -40 to +85ºC, temperature compensation of the crystal controlled synthesiser is accomplished using the on-board temperature sensor which may be used by the host system. The LPRS eRA range is comprised of 433-434MHz and an 868 to 920MHz multi-frequency transmitter and transceiver modules plus a development kit with a USB interface. Applications for LPRS’s eRA wireless modules include building and home automation, sports and leisure systems, security, vehicle logistics and asset tracking, environmental monitoring and energy control, industrial control and smart metering. 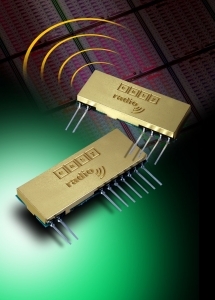 In addition to its own easyRadio Advanced (eRA) wireless modules the LPRS product range now includes, narrow band long range wireless modules from CDT, the IQRF range of wireless networking components, the IQVC range of visual control panels together with antenna, wireless key fobs and a wide range of sensor products.